Signal towers provide visual and audible signals of machine states. Mounted on the control panel or the machine itself, their signal can also be reliably recognized and identified at a distance.The specially shaped lenses have a Fresnel effect to ensure excellent light levels. One really major advantage of SL signal towers is that each individual module is freely programmable by simply repositioning a wire link, without needing any additional wiring or tools. Up to five levels can be actuated separately. 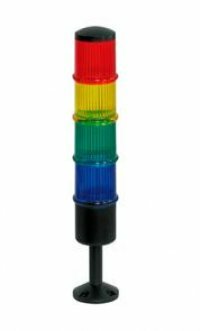 Any combination of continuous light, flashing light, strobe light or acoustic alarm is possible. Easy installation method. Plug on the bayonet fitting, turn it slightly - and it's done.